there are no catches, no sign ups or registering emails, simply view or print and use with our best wishes. of step by step instructions including photos. We have built a new chook dome for our garden, also known to some people as a “chicken tractor” or a “chicken dome”. We now have two domes in operation circulating around the garden. 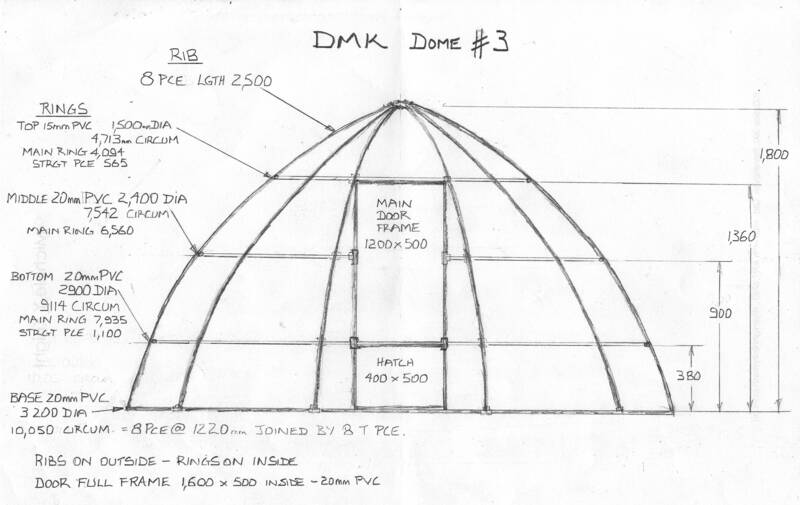 This new Dome is made to our original dome plan sketch below, and we have posted photos and instructions of each step of the construction for you to follow. Note that there are two things that set our our dome design apart from others you may have seen. ONE: We use a third horizontal ring for extra strength. And most importantly TWO: The use of a glued ‘T’ junction at the bottom where the ribs meet the base ring. Incorporating this ‘T’ junction negates the use of criss-cross wires to pull the dome into shape as per Linda Woodrow’s design. ALSO: Our experience clearly demonstrates (against popular opinion) that it is better to attach the tarp to the dome permanently, and then peg down the dome when strong winds or storms come, it is a whole lot stronger. This post is a pictorial with instructions and hints on “How To Do It” . . . or rather more accurately . . . “How We Did It” The following is only a guide, plenty of handy women & men, can take one look at Linda Woodrow’s dome concept and its principles, and run with it and work out a pretty good facsimile for themselves. We have posted how we approached this construction, and hope it will act as a useful guide to the complete novice, or a reference of “how the hell they did it” to the experienced builder. We are estimating the whole dome will cost about A$250 to A$300. It is difficult to put an accurate figure on this because we already have some of the materials we’ll be using, but they are not expensive, and can last for years. A second dome was necessary to expand our garden from two Mandalas to four, with two domes rotating as planned. We had eggs incubating under a broody chook at the time of writing this post, eventually to fill this dome, so we had to get moving and be ready to move the hatch-lings in a few weeks. In the meantime the chicks will be in bliss in the recently refurbished broody pen below. It’s quite literally goanna & dog proof, and large snake proof. For more details on this Broody Coop, click on picture below. BUT WHY USE A DOME? There are other good reasons for persevering with a dome rather than a square shape. Chooks can be bitchy girls indeed, and the will naturally establish their pecking order – literally pecking the weaker chooks! Being a circular cage, it is difficult for the weaker chooks to be cornered, after chasing around a couple of laps, they all forget what they were doing, so the maintaining of the pecking order is not so relentless as in a cage with corners. They will be much happier chooks. Second important reason for a dome is the shape has minimal wind resistance. We’ve had domes go through a couple of cyclones and the shape is more sleek than a square shape. If the tractor is light enough to lift and move, it will also be light enough to blow away or be blown over. We wedged four square bales of hay inside our dome and used a few hefty tent pegs around the base ring where the ribs come down. We faced the dome opening into a sheltered direction from wind. The bales got wet & heavy very quickly, the second cyclone we even pre-wet them, and the chooks sheltered on the ground between them, we didn’t loose a chook. The ground was so wet that worms were looking for higher dryer ground, and what we found after the cyclone was a bonus . . . the bales were chock-a-block full of worms. Our garden system closely follows Linda Woodrow’s mandala circles system, as per her book, The Permaculture Home Garden. Our garden beds are circles thereby maximising the Permaculture Edge Principle, so the dome is built to fit neatly over the beds. It’s a ‘no dig’ system where the dome and it’s chooks become the tractor. The dome has to be light enough to get inside and lift and carry, yet strong and sturdy enough not fall apart when you do. It has to be rigid enough to last a long time and not go out of shape, and withstand strong winds and storms. It is important to use PVC tube of 20mm diameter. Do not use the black poly pipe as it will slump and change shape dramatically on a hot day, or in a strong winds. Do not use electrical conduit, it is smaller and has less wall thickness and not as strong or flexible. The internet is littered with examples of dome failures using these. Stick to the white PVC pipe, it is cheap and easy to use. As the dome building description is long & detailed, the process has been divided into six sections . . . Categories: Cages & Tractors, Chooks, Domes | Tags: building chicken tractor, chicken dome, chicken tractor, chook dome | Permalink.